Lavraki Psito (pr. Lah-VRAH-ki psee-TOH) is grilled sea bass. Greek fresh fish is so delicious that actually we just add a few ingredients, such as salt, pepper and oregano before grilling it. We then serve it with some ladolemono on top. Occasionally, I make something different for a change. This time, I added some finely chopped garlic scapes, green onion and fennel fronds from our garden, that added additional taste to the flesh of the fish. Today is Palm Sunday for the Greek Orthodox and just a week before Easter. Althoughit it is a fasting period, which means that for 48 days we should abstain from eating foods derived from animals, containing blood and from animal derived products such as dairy products, this year we did not fast all the period but shall start as from tomorrow. On some days olive oil and wine is also not allowed. The fasting period is almost vegan. However, cephalopods are allowed, since they do not have blood, as well as gelatin and honey. 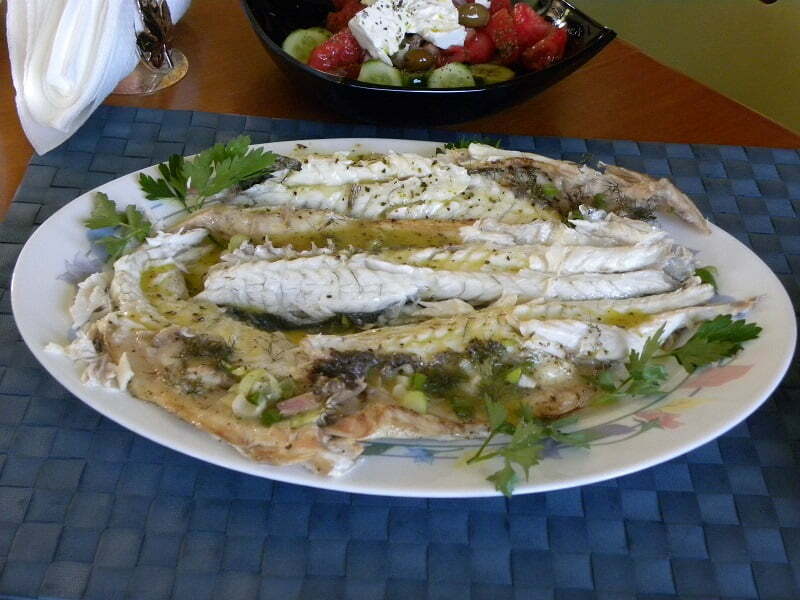 However, on Palm Sunday fish is allowed to be eaten and although we are not fasting, we followed the tradition and today I grilled some Lavraki (European Sea Bass). Ladolemono is a Greek dressing with extra virgin olive oil, lemon juice, salt, pepper and oregano. This time I added some Dijon mustard in the ladolemono and that made it extra delicious. I just added all the ingredients in a recycled jar and shaked it a couple of times until the ingredients were mixed together. My new oven is fan forced and I used the grill with air. Fish does not need too much time to be cooked and since you are using the air it doesn’t need to be turned on the other side. Scale and clean fish. Wash them and allow them to strain. Just before grilling, season them with salt, pepper, oregano (including the cavity). Mix garlic, onion and fennel and fill the cavity with 1 tablespoon each. Preheat oven to 170o C / 338o F grill + air and with rack on highest position. Place the fish on a rack with baking tin below for the drippings to fall in and grill for about 20 minutes, depending on your oven. (No need to turn the fish on the other side). Open fish and remove backbone, head,fins, tail and any visible bones. Serve with ladolemono moustardas on top. Healthy, flavorful and delicious! A beautiful meal. I totally agree: when you have some nice fresh fish, you don’t need much to turn it into a delicious dish and your grilled sea bass is spectacular.